On our Christmas Eve edition of the Marc Steiner Show, we offer two hours of holiday music. We'll start out with an interview and music by Peabody's own conductor, Edward Polochick. On our Christmas Eve edition of the Marc Steiner Show, we offer two hours of holiday music. 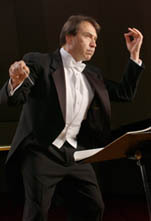 We’ll start out with an interview and music by Peabody’s own conductor, Edward Polochick.